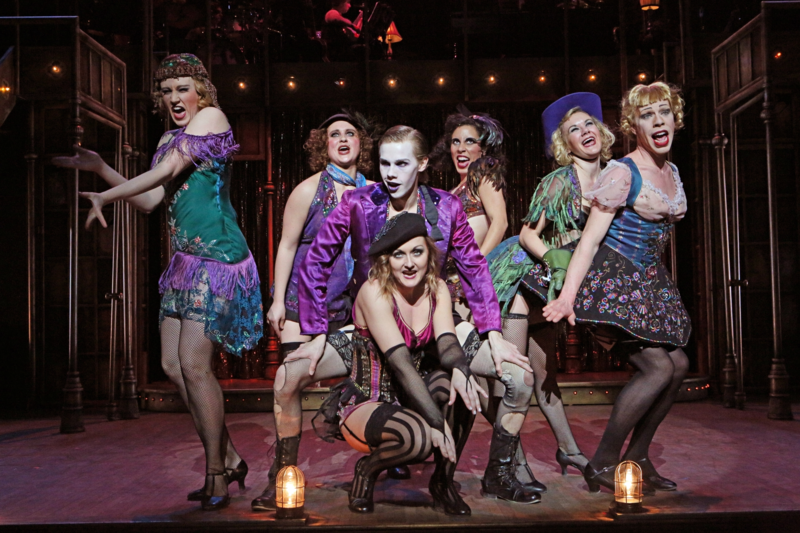 Be forewarned: showing up late to Theater Latté Da and Hennepin Theatre Trust’s new production of Cabaret is a bad idea. This is not because the story will be hard to follow (it won’t be) or because you’ll miss out entirely on a good song (there’s a reprise), but because you will be madly jealous when later overhearing what you missed. Those who are in their seats as the lights dim are in for a rich basketful of treats–including some special and unexpected ones–at the top of the show and at the end of intermission. From the title Cabaret, you might expect that this is a musical light on substance and heavy on fun songs, exposed skin, and both witty and dirty humor. The second part is certainly true, but amidst the decadence of this music club setting in Weimar Germany lie the seeds of Nazism and violent anti-Semitism. Peter Rothstein’s direction butters you up with laughs and dazzle, only to hit you that much harder when your guard is down. Most of Cabaret dazzles, in fact. The show unfolds in a splendid arc; the Emcee, played by Tyler Michaels, is riveting and ribald. The Kit Kat Boys and Girls who form the main chorus are also a treat for the eyes and ears, with one Kit Kat “Girl” (Jeffrey C. Nelson) in spot-on drag for some extra spice. Lavish new costumes by Rich Hamson appear with each new number, and Michael Matthew Ferrell’s choreography is dynamic and pleasantly edgy. The flexible unity set, designed by Kate Sutton-Johnson, never felt too static. Kira Lace Hawkins’s turn as the Kit Kat Club’s star performer Sally Bowles is suitably magnetic without polishing out the rough edges that round out the character. Adam Qualls’s strong supporting performance as Ernst Ludwig is one of the key pivots when the musical turns darker. Life outside the cabaret isn’t always as fun. Sally Wingert and James Michael Detmar have endearing chemistry as the doomed older couple Fräulein Schenider and Herr Schultz, but in the performance seen for this review (Saturday, January 18) Wingert–an actress better known for spoken theatre–was vocally overshadowed by her castmates. Microphone levels were also too hot for several numbers, distorting and muddying the sound; the Pantages would have benefited from a stronger stereo mix for the chorus’s vocal mikes. These technical and balance issues will hopefully be smoothed out as the run continues, leaving a show that is fun, daring, and delightful.